In recent weeks, we've taken on shoes and unmentionables. But what about everything else? Find a good drycleaner. You want one who changes its fluids regularly (read: no chemical smell on clothes), knows how to care for a range of fibers, and has good customer service. It's worth looking around for someone you trust. When in doubt, always launder according to the primary fiber, even if it's a mix. Care labels may be overly cautious — many will recommend dry-cleaning as a default — but they're always a useful guideline when you're not sure how to launder. Joan Crawford was right: Padded or plastic hangers are always better, even if it's hard to resist those extras from the cleaners. Moths like the oils on clothes, so clean things before storing. Then, use anti-moth spray, cedar or lavender (or, I guess, mothballs if you're nostalgic) when you store them. Cedar hangers are great, too. Try to avoid jamming your clothes together in the closet, even if this means rotating them. Dry-Cleaning: Keep in mind that a lot of labels will rec this just to be on the safe side. And if you're wary, sure, go for it. But dry-cleaning can take its toll on delicate fabrics, so don't do it too often. Keep in mind that what can be dry-cleaned can usually be hand-washed. That said, some are hard to dry, so lighter silks like chiffon or repe de Chine, or anything hand-dyed, dry-cleaning is a good idea. Cheaper silks also need a light touch, so might be good dry-cleaning candidates. Just be sure you're dry-cleaner's good, and tell them that the garment's silk so it's not washed with rougher fabrics. Hand-Washing: When silk's good quality, hand-washing can actually result in a really nice drape and patina. Keep in mind that natural fibers do best with consistent temperatures (otherwise they can shrink) so stick with lukewarm water throughout. Hand-wash as you would any delicates, usng a small amount gentle detergent like Ivory or shampoo. If the color is fading, try rinsing the silk with a splash of white vinegar; this will help prevent further fading. Machine Washing: In general, this should be your last resort, but if you're short on time, just be sure to use a mesh delicates bag (or knotted pillowcase) and be sure your washing machine is clean, so as to avoid staining the fabric with soap. Use the same gentle detergent you would to hand-wash, and run it on the delicates cycle. If a color is faded or a white is yellowed, a capful of vinegar may help. Stains: Silk stains easily, so it's important to tackle them ASAP. Sweat stains in partoicular can eat away at the fabric: if it's a "fresh" (sorry) perspiration issue, try washing with a little ammonia dissolved in water. Otherwise, try the vinegar method. Drying: First, never use the dryer. The heat and the agitation are bad news for silk, or really any delicate. As with other delicates, roll silk in a towel and press it dry, then, depending on the weight, it can be hung (light silk) or laid down flat (heavier silk knits.) Do not wring it out. And dry away from direct sun or heat. Ironing: Iron silk while it's still damp, or dampen before pressing. Avoid steam, however, which can stain. When in doubt, iron inside-out to avoid damaging. And, of course, if your iron has a "silk" or "delicates" setting, use it. Otherwise, just the lowest setting on an iron. Obviously, a steamer works very well. Storage Putting silk away? Don't use plastic; instead, opt for something breathable, like a cotton pillowcase. It's moth-bait, so think cedar, lavendaer, or mothballs for that thrift store aroma. Day to day, just let it breathe and keep it from snagging. Dry Cleaning Don't clean your wool constantly: it wears it out. Instead, spot-clean as necessary, brush off lint, and dry-clean only as needed. Again, you want a really good cleaner who knows their stuff and changes their cleaning fluids regularly. A good one will send back clothes without any chemical odor. Storage If you're really diligent, steam out wrinkles after wear and before putting them away. If you;re a regular slob like most of us, just folk along the creases and put on sturdy hangers. 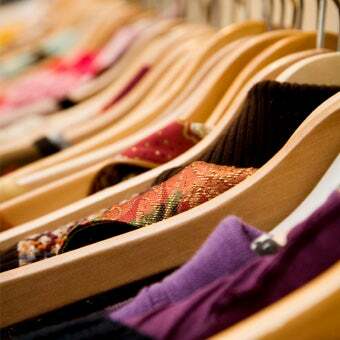 Put coats on coat-hangers to avoid hanger-bumps. Being a natural fiber, wool is another moth-magnet. Moths are atrracted to the oils on clothes, so launder before you put it away for the season. So bag wool in breathable bags or cardboard boxes and use cedar or some other moth deterrent. Make sure your storage place is dry. Dry-Cleaning: If you dry-clean, do it as infrequently as possible: it can be hard on some fibers and it's expensive! Hand-washing. Most sweaters can be hand-washed. The method is the same for most materials, although you'll want to be extra-gentle with cashmere. Wash it lukewarm with a gentle cleanser, roll it dry. Drying. Always dry knits flat, and away from direct heat. Ironing. Use a low setting and, with wool, give it a little "knead" after to keep it form going flat and weird. Lint: We've all plied a sweater stone or lint brush only to find we've lost half a sweater. Much gentler and better is a cheap kid's hairbrush. If you're vigilant, brush after every wearing. The rest of us will do it as needed. Storage: Store flat and folded; avoid hanging, which can stretch the fabric. Use tissue if you're worried about creasing. Once again, moth prevention is the name of the game for long-term storage, so launder, anti-moth, and pack somewhere dry and breathable: as always, muslin and cardboard are good choices. Washing: No need to dry-clean, although you can: most acrylics can go right in the wash and dryer.That said, wash gentle and never use bleach. Drying: When it comes to lycra, the heat of the dryer actually helps it regain its shape. Spandex is another story: drip-dry. Ironing: Iron quickly and avoid letting the hot metal rest on the fabric; it can scorch or damage easily. Washing: You know the drill. Both these fabrics can be machine or hand-washed, and normally are. But dry-cleaning gets them crisp. The choice is yours! Washing and drying soften both. Ironing. Iron linen while damp. Both iron up like a dream — and, obviously, steam easily too. All knits, even tees, hold up best when dried and stored flat. You can refresh flannel's nap with a clothes brush. Blood: dampen; scrub with hydrogen peroxide rinse. A reader also sent me a really interesting tip: she said your own saliva will work on your own blood stains. I have not yet tried this; please report. Coffee/Tea: Wash with soapy water; rinse. Now, pour boiling water over the stain and, if possible bleach in sunlight. Still stained? Rinse in water with with 5% hydrogen peroxide or a capful of vinegar. And if all else fails, just coffee-or-tea-dye your garment; it'll look surprisingly good! Lipstick and makeup: If it doesn't come out in the wash, try sponging with ammonia, then rinsing. Red wine: You know the drill! Sprinkle the stain with salt,brush that away, then pour on some seltzer (or, you know, water.) If need be, rinse with rubbing alcohol. ...and, after that blood/spit tip, I can't wait to see what else you've got! Please do send along any other tips and tricks you've found in the course of caring for your clothes. It will be appreciated!